SmartAccept can help businesses cut the average hold time almost in half – significantly reducing ASA and critical service indicators and offering a better customer experience. 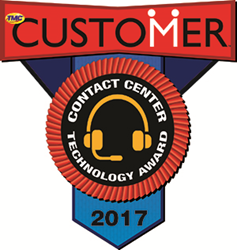 Noble Systems Corporation, a global leader in omnichannel contact center technology solutions, is the recipient of TMC’s “2017 CUSTOMER Contact Center Technology Award” for Noble SmartAccept®. The award is presented by CUSTOMER magazine. Noble SmartAccept's patented technology allows companies to reduce hold times, even before they answer a call, making an intelligent decision on whether to answer the call immediately or continue to ring the line based on agent availability. By substantially decreasing hold times, companies can improve key service levels and increase customer satisfaction while lowering their telecom costs. This 12th-annual Contact Center Technology Award, presented by CUSTOMER magazine, honors vendors that embrace technology as a key tool for customer service excellence. This award distinguishes their success as innovators, thought leaders, and market movers in the contact center and customer care industries. Noble Systems Corporation is a global leader in the customer communications industry, providing innovative solutions for Contact Center, Workforce Management, and Analytics technologies. Tens of thousands of agents at 4,000+ client installations worldwide use Noble platforms to manage millions of customer contacts each day. Noble offers a unified suite of inbound, outbound and blended omnichannel communications, strategy planning, resource management, and compliance tools for companies of all sizes. Our premise, cloud, and innovative premise/cloud hybrid platforms include ACD, predictive dialing, blended processing, recording and monitoring, IVR, messaging, interaction analytics, and workforce management. With almost 150 patents, Noble leads the way in pioneering solutions for the contact center market. For more information, contact Lee Allum at 1.888.8NOBLE8 or visit http://www.noblesystems.com. TMC is a global, integrated media company that supports clients' goals by building communities in print, online, and face to face. TMC publishes multiple magazines including Cloud Computing, IoT Evolution, Customer, and Internet Telephony. TMCnet is the leading source of news and articles for the communications and technology industries, and is read by 1.5 million unique visitors monthly. TMC produces a variety of trade and industry events, including ITEXPO, the world's leading business technology event, as well numerous other industry events (visit TMC Events for a complete listing). For more information about TMC, visit http://www.tmcnet.com.